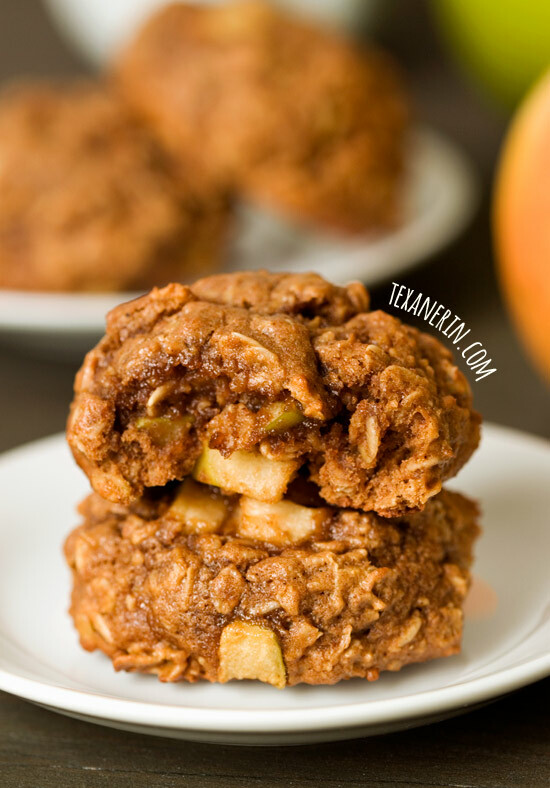 These apple cookies are made healthier with whole wheat flour, oats, applesauce and coconut oil! I am SO excited that apple season is here! I always look forward to this time of the year because it means the start of fall baking, which we all know is the best baking season. ;) That and it means I get to get out of the city and into the countryside for some apple picking. There’s nothing I enjoy more than getting out of Berlin, even if it’s just for half a day. So you can expect to see loads more apple recipes until October 1. And then it’ll be all pumpkin, all the time, until Thanksgiving! Or maybe not. I’ll try to contain my pumpkin enthusiasm. There are 1 1/3 cups coconut sugar in these apple cookies (you can also use unrefined sugar) but there’s 4 1/4 cups of oats and flour so I don’t think it’s that bad. It yields a big batch! I really don’t recommend reducing the sugar any more as that’ll produce a more cakey cookie. And honestly, these aren’t that sweet. I used refined coconut oil because that’s all we have over here (as far as I know) and refined coconut oil has no coconut taste. If you use unrefined coconut oil, these might have a slight coconut taste. I haven’t tried it but I bet dried apples would work well here. Just in case you have some dried apples you’re trying to get rid of. If you didn’t see my post on Facebook about this yesterday, I’m now contributing to the Peanut Butter & Co recipe blog! 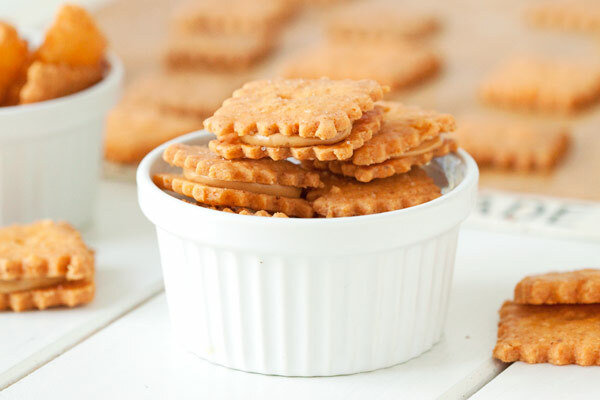 You all know I love my cheese and carbs so I thought what better way to start with than peanut butter cheese cracker sandwiches. And they’re gluten-free! Preheat the oven to 375°F (175°C) and line a baking sheet with parchment paper or a Silpat. Whisk together the dry ingredients (flour through nutmeg) in a medium bowl and set aside. In a large microwave safe bowl, melt the coconut oil in the microwave. Add the applesauce, sugar, eggs, and vanilla and stir. Let sit for 5 minutes to give the sugar a chance to dissolve, and then stir one more time. Add the dry mix to the wet mix and stir just until combined. Stir in the oats and apples, again stirring just until combined. Place the dough in the refrigerator for about 30 minutes or until it's firm enough to roll into balls. Form the dough into balls, about three tablespoons in size (I used this large cookie scoop) and place about 1 1/2" apart on the lined baking sheet. Bake for 10 - 12 minutes or until the middle appears to be set. These go from just done to overbaked very quickly. If you refrigerated the dough for longer than 30 minutes, you might need to add a minute or two to the baking time. Let cool on the baking sheet for 3 minutes and then remove to a wire rack to cool completely. Store in an airtight container for up to 3 days and place in the refrigerator after that for another 4 days. 26 comments on “Apple Cookies (100% whole grain, dairy-free)” — Add one! Hi! I’m new to your website and am absolutely in love with your style of baking, totally what I like to do, only you know what you are doing. I’m usually guessing and it doesn’t always work out! Anyways, I’m curious, my cookies were super moist, almost a bit too moist for me, and they spread and got flat, not like in your picture where they are more rounded and thick. Did I do something wrong? Also do you think you might have a recipe coming up for a crunchy oatmeal, coconut, and something else cookie?? Hi! We picked wayy too many apples this year. I am sick of making applesauce so I am very excited to have come across this delicious looking recipe. Do you recommend peeling the apples? Thanks! Hi, Heather! Peeling the apples isn’t needed. I didn’t and couldn’t taste the peel in the cookies. :) I hope you’ll like them! I am pretty new to cooking gluten, soy, and dairy free. I am highly allergic to the above. Can I just replace the flour and oats to gluten free for this recipe? What about cornstarch? What can I use instead of that? These look delicious! I love anything apple (and pumpkin) in the fall. Quick question about the sugar – do you think I could do a mix of honey and sugar (half/half or another ratio)? I wasn’t sure about adding in over a cup of sugar to the recipe. Thanks! These cookies are perfect for my son’s lunchbox. I can’t wait to bake them. I made these apple cookies this past weekend and they were terrific. SO fast to make an they were crispy when I baked them and put them on a cookie rack. The next day I put them in one of those green containers and it softened them up and gave them a real spice flavor. I have been telling all of my patients about this recipe and giving it to them. Thanks so much I can’t wait to try the next recipe. Erin, these look perfect. I want a bite… Make that two bites. There will be no containing my pumpkin obsession. It’s already getting out of control and it’s only the 2cnd week in September. Erin these are right up my alley. I love apple desserts, especially if said dessert is COOKIES! :) Being a healthier dessert is an added bonus. They look amazing! 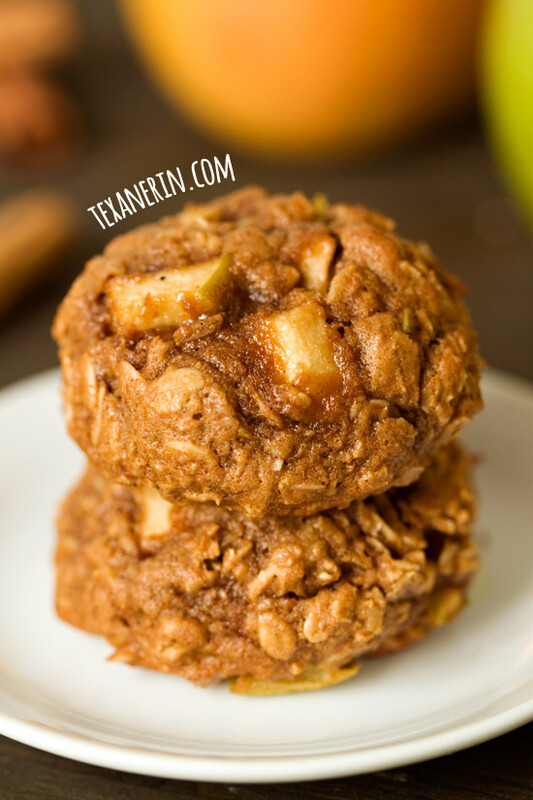 I love apples too, these cookies look so good with the oatmeal and fall spices! Hello Erin, thank you for this recipe which I am going to try soon. Lately I am looking for healthy recipes and I also like apple baking. So this is just what I want! Can’t wait to try it! I love your enthusiasm for fall baking – it makes me want to get in the kitchen and start playing with apples and pumpkin! Have you still not tried baking with pumpkin? You have to try it out! BRING ON THE APPLES AND PUMPKIN!